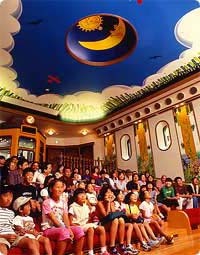 Ghibli Museum, Mitaka in Japan - Ghibli Original Short Animated Feature at the Museum Only! Ghibli Original Short Animated Feature at the Museum Only! The Saturn Theater is a small theater in the basement of the Museum with only about eighty seats. There you can watch an original short animated feature from Ghibli, which can only be seen in the Museum's theatre. A blue sky and lots of colorful flowers are drawn on the ceiling and walls. When the film ends, the windows open and the sunshine comes in. You can sit on a little red bench or the back of a seat to see the big screen without being blocked. Most of you probably don't know how a movie is projected. But here the projectionist's room, which looks like a tiny train car, is transparent, so you can see how film moves through a projector.